Donna goes to visit Harvey to question why he never got on the plane and he says he was scared. She manages to talk him round and he boards the plane. He visits his mother, who is shocked to the core, but she is busy and says she can't make dinner, but she would be able to the following night. Harvey then goes to visit Marcus, who urges him to cancel his hotel and stay with the family. Harvey agrees and things appear to be going well. We got a flashback of Harvey's father's funeral and it revealed that his mother brought her boyfriend along. This did not sit well with Harvey, who caused a huge scene. 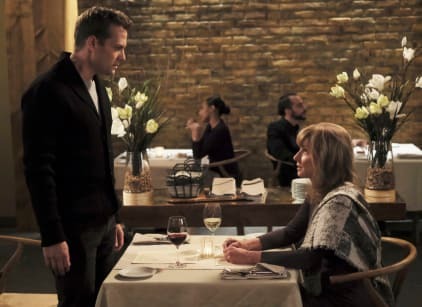 At dinner, Harvey and his mother bond, but the whole thing goes awry when Lily reveals that she accepts Harvey's apology, but he was quick to point out that he had nothing to apologize for. The pair bicker, before Harvey ups and leaves. It does not take long for his step dad to appear and argue with him for putting Lily through all of that. Harvey quickly says that he's leaving, but not before Marcus reveals that the man who Harvey hates was there when he took unwell again. Shocked that he had no idea Marcus was unwell again, he decides to patch things up with his family in the hopes that they can move on. Back at the firm, Louis takes on one of Harvey's clients because of Harvey being out of town. Rachel pointed out that it proved he was serious about the firm. Mike got offered a job at the law firm from the previous week and was made an advisor. The others took issue with this because of Mike's past, but he was quick to reveal the details of his jail sentence. When Harvey returned, he said that he and Louis could share leadership duties and decided to keep the name the same.